silky soft 40 demier lingerie nylon fabric, soft elastic waist & legs, ruffled lace around the legs, could be use as a nappy cover, pretty flowers and bows. This item is HAND MADE and may take 10-15 business days to ship. Best bloomers money can buy ! 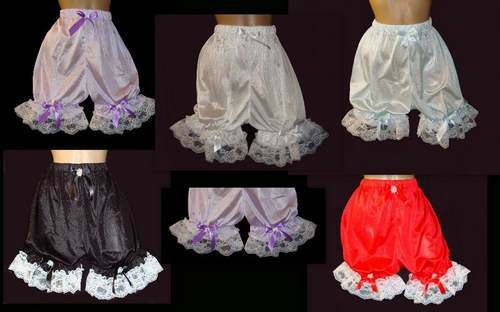 You will not find more quality made pretty bloomers than you will here ! I should know I have bought 8 pairs !